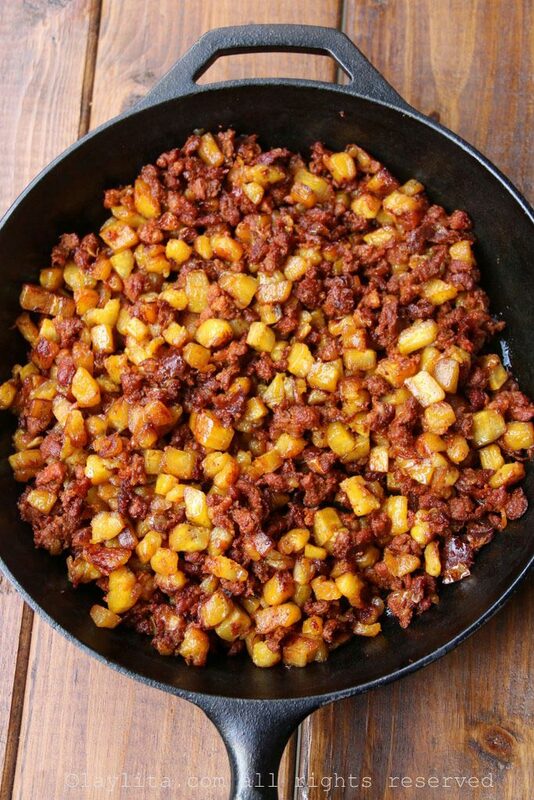 This chorizo and ripe plantain hash is a picadillo style breakfast dish made with onions, fresh chorizo, and sweet ripe plantains. Last year I was making empanadas filled with ripe plantains, bacon and cheese (Yes, I need to get around to posting that recipe). 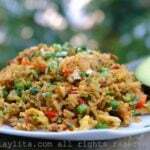 As I was making the filling, I realized that a ripe plantain hash or picadillo style dish would be great on its own. 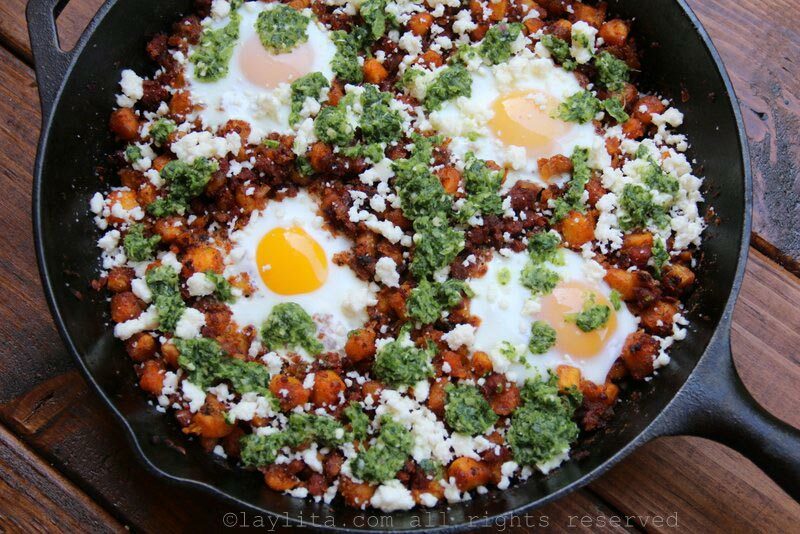 There’s no denying that it would work great with bacon, but I though chorizo would be an even better idea. 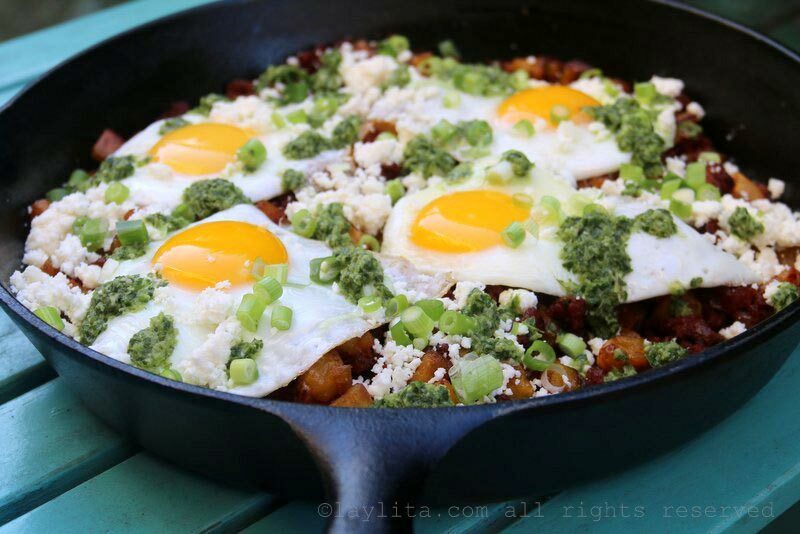 Plus, I ended up adding eggs, and queso fresco. Oh, and did I mention that I also served it with aji criollo style hot sauce (a spicy sauce with cilantro and hot peppers) AND avocado? 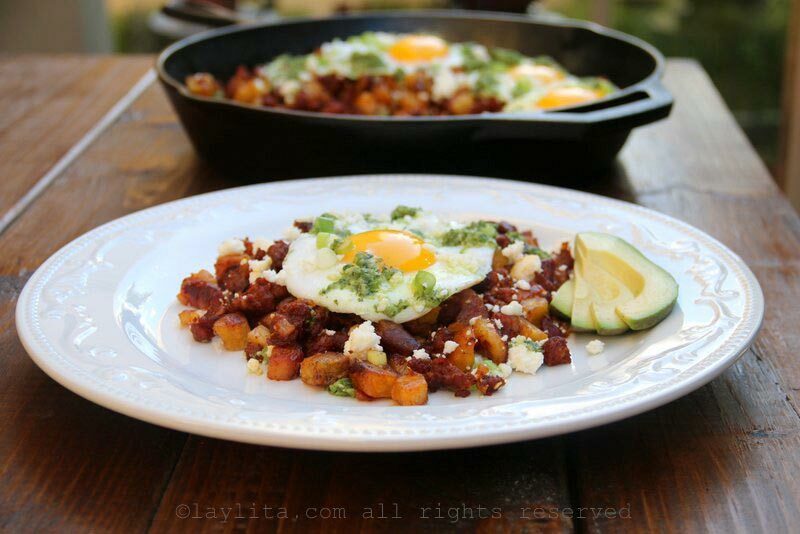 Recipe for chorizo and ripe plantain hash, this picadillo style breakfast hash is made with fresh chorizo, sweet plantains, onions, and served with eggs, queso fresco, avocado and hot sauce. 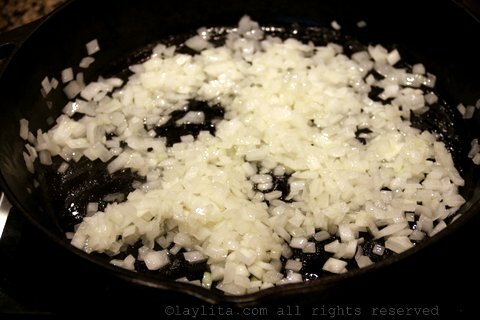 Heat 1-2 tablespoons of oil or butter in a medium sized frying pan over medium temperature, add the diced onions and cook until soft and translucent – about 5 minutes. 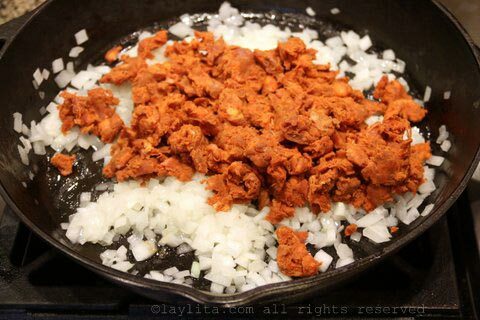 Add the crumbled chorizo and continue cooking until the chorizo is fully cooked. 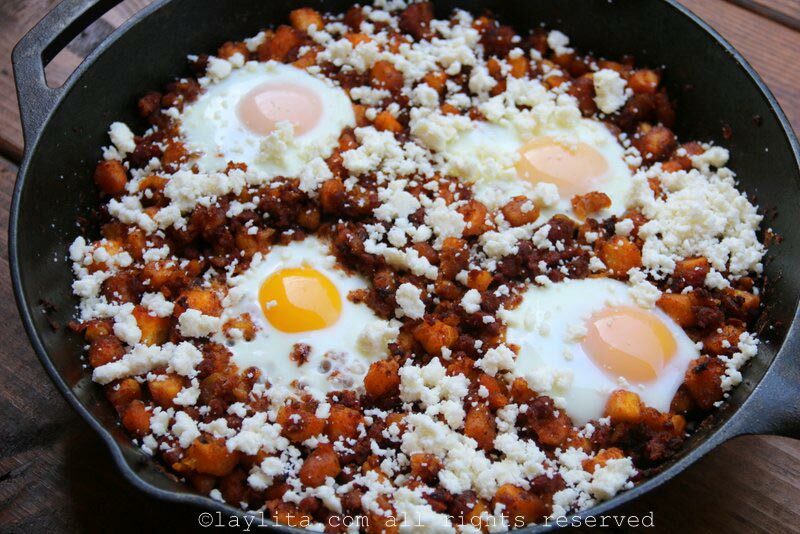 You can taste, once the chorizo is cooked, and adjust some of the basic spices if need. The flavor of chorizo tends to vary from one brand or store made chorizo to another, so if you prefer more achiote (annatto), paprika, chili powder, cumin, garlic, or other spices, you can add more until it has the flavor you prefer. Drain any excess grease according to your preference (it will depend on the chorizo, some have very little) – you can also use some of the excess grease to cook the diced plantains. 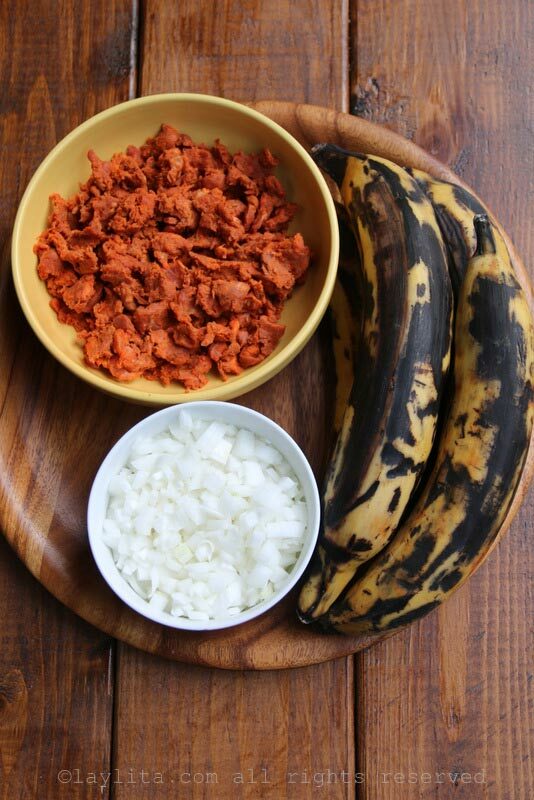 You can transfer the chorizo to a separate plate and cook the plantains in the same pan or use a separate pan. Heat the remaining 1-2 tablespoons of butter or oil (or use the excess chorizo grease instead). Add the diced plantains and cook over medium heat, stirring to prevent them from sticking to each other and the pan, until they are golden. 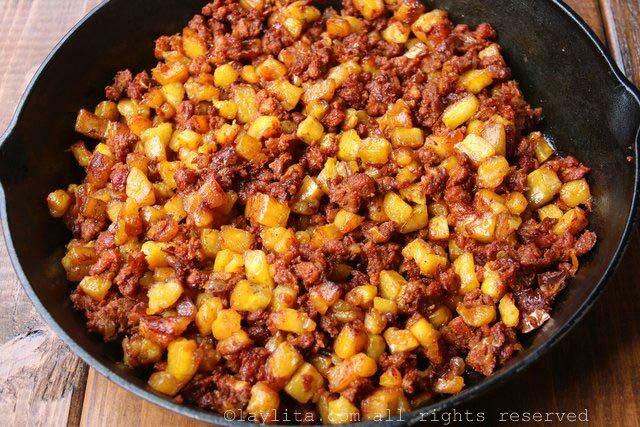 Add the cooked chorizo back to the pan with the plantains and mix well. 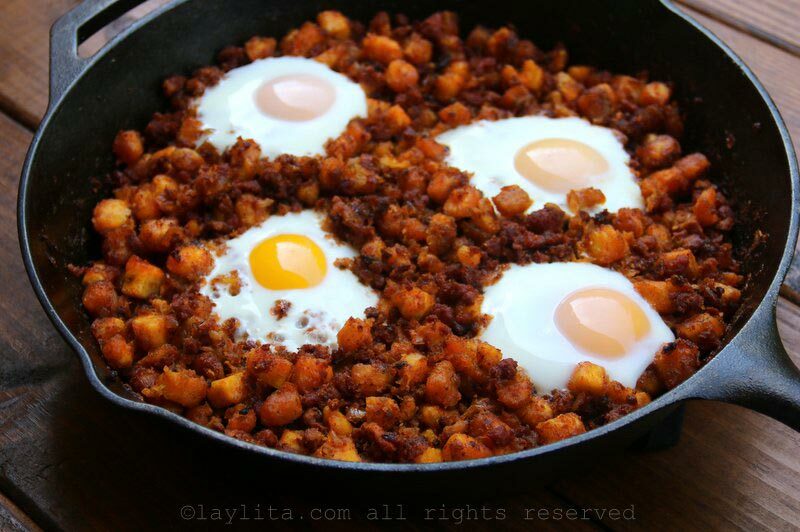 The eggs can be added directly to the pan with plantain and chorizo hash, reduce the heat, cover the pan, and cook on low until the egg whites are cooked and the yolks are at your preferred level of doneness. You can also put the pan (if it’s oven proof) into the oven (pre-heated at 350-375F) for about 10 minutes. Another quicker option is to fry the eggs separately and then add them to the pan or to each individual plate. Serve the ripe plantain and chorizo has immediately with the eggs, avocado slices, crumbled queso fresco, and hot sauce to taste. 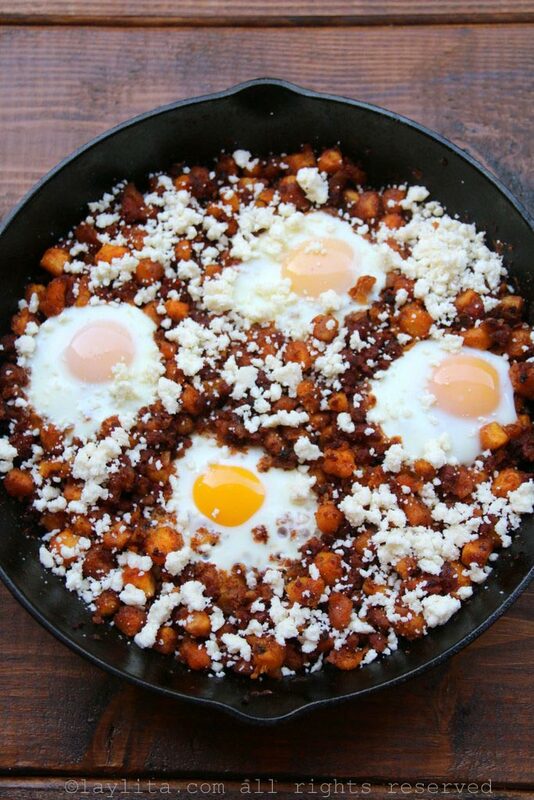 You can also replace the chorizo with bacon, leftover roasted pork (hornado) or braised pork (fritada or carnitas style), fried pork belly (chicharron). 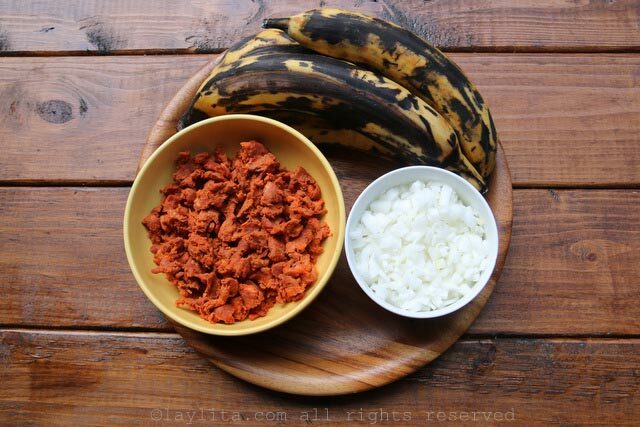 For a vegetarian option, you can either replace the chorizo with additional plantains and/or caramelized onions. 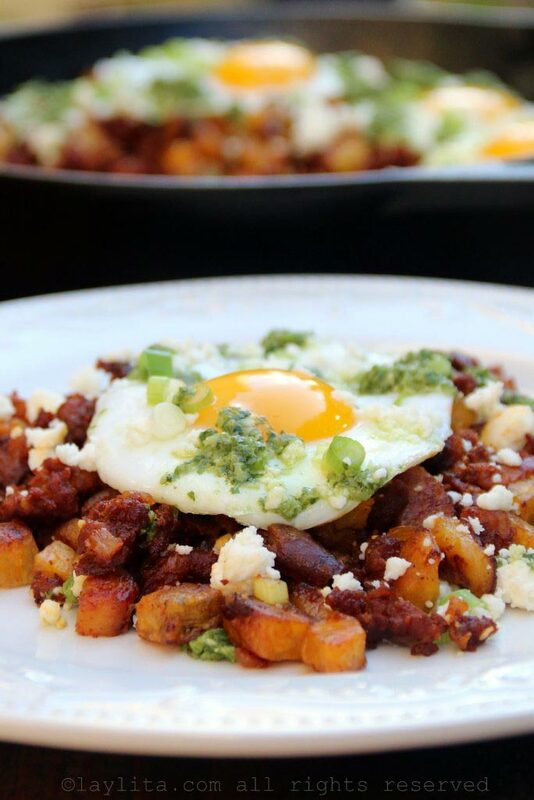 It’s probably obvious by now that this chorizo and ripe plantain hash picadillo is really just a way to combine my all-time favorite ingredients into the perfect breakfast dish: ripe plantains, chorizo, eggs, queso fresco, hot sauce, cilantro, and avocado. 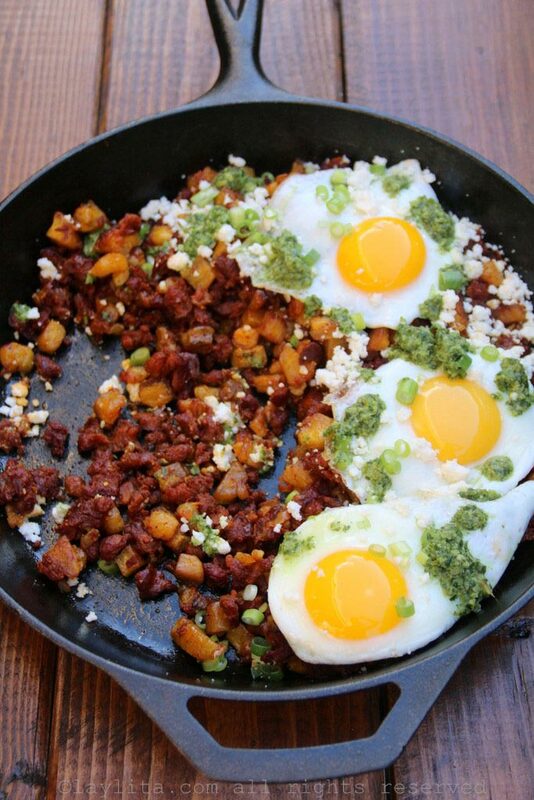 Actually, never mind about the breakfast dish part, it’s also amazing for lunch or dinner. 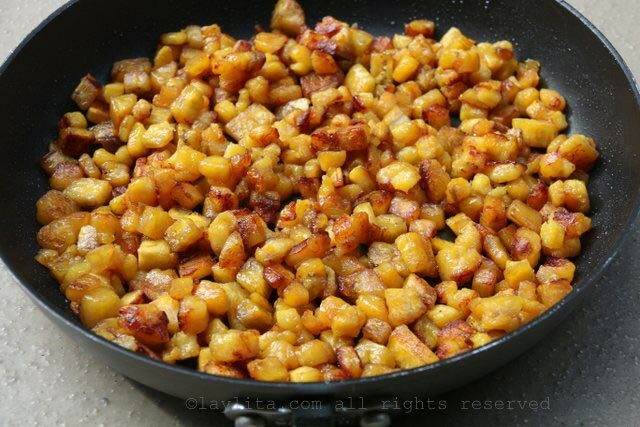 In many cases, when I prepare a dish with ripe plantains I usually slice them and fry/bake/grill them, however for this ripe plantain hash, I diced the plantains before cooking them. 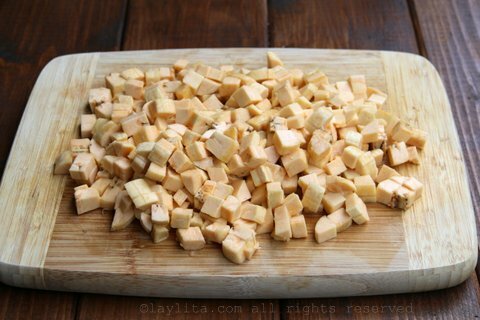 They do require more constant attention and stirring while cooking when they are cut into small pieces. I also tested if it was best to cook the chorizo and plantains together or if worked better to cook them separately. 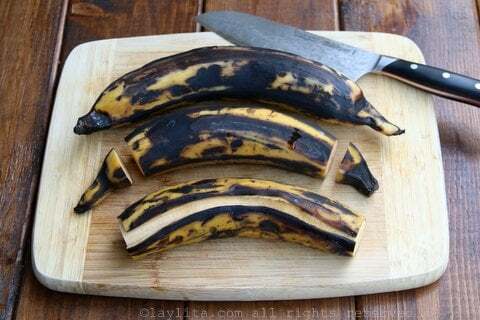 They can be cooked together, however if you want the plantains to get nice and crispy it’s better to cook them separately. 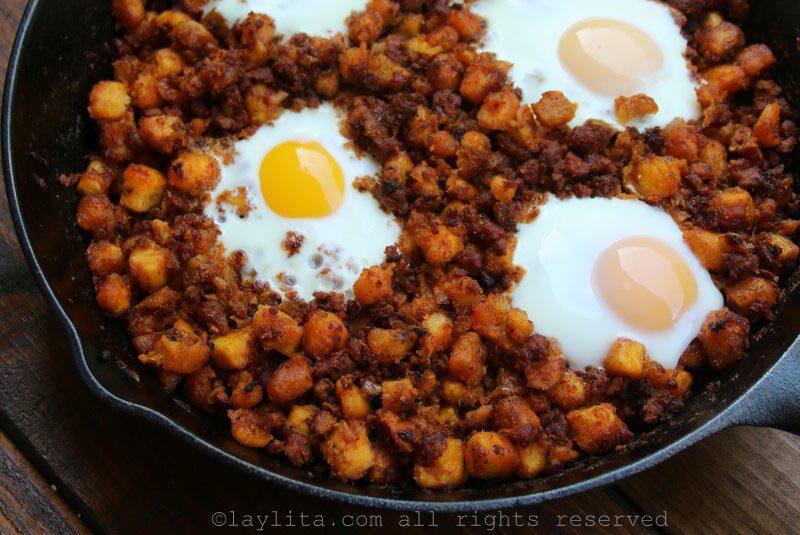 You can start out by cooking the chorizo with onions, then transfer the cooked chorizo mix to a bowl, and in the same pan cook the plantains until they start to get that nice caramelization, and then combine them together before adding the eggs. Or you can also have 2 pans going at the same time, and the mix them together. 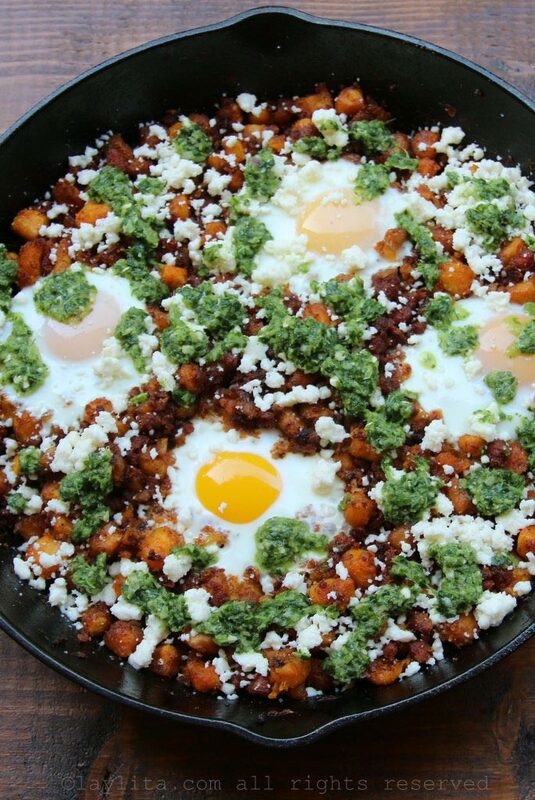 I used a semi-soft uncured Mexican style chorizo for this recipe; you can also use the very soft raw chorizo (store bought or homemade) or longaniza which is sometimes slightly firmer than some of the very soft chorizos. 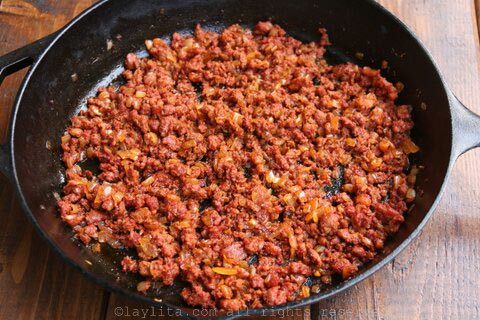 You can also make your chorizo mix using ground meat (beef, pork, or a combination plus spices like achiote, paprika, cumin, ground chilies, garlic, etc), or for a vegetarian option you can use a veggie chorizo. 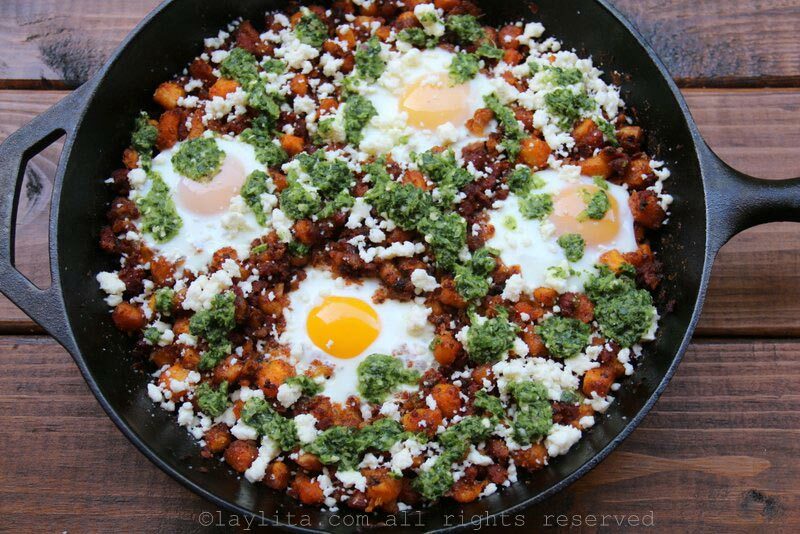 You can add the eggs directly to the pan and let them cook with the chorizo plantain hash, or you can fry the separately and serve them on top. This sounds delicious. I can’t wait to try it. I will use #BigBanana ‘s frozen, already diced, ready to go sweet plantains. OMG!! !This looks amazing and delicious!! It’s like a bomb of tastes!!!! 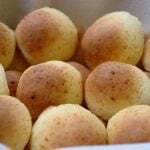 I will definitly try it but not for breakfast, I’ll do it for dinner so I can relish in relax! Thank for sharing!